Souvenirs- I didn't buy much in Disney World for the kids or us. I went with a plan on what we would buy and stuck with it. So in advance I got the kids Disney: toys, shirts, and surprises to bring with us on the ride down and while we were there. I found most of the T-Shirts that were Disney related (Jake, Monsters, princesses, Minnie, and Mickey) at Target, Old Navy, and Children's Place. The most expensive $12 before coupons and $5-10 cheaper then Disney World. Better quality then the cheap stores outside the Parks around Orlando. Lanyards: I bought these from Party City(99cents) before we left incase the kids asked for pins (they didn't so they just became necklaces for them. Although the kids didn't get pins, I did! I started collecting over 10 years ago, so I had to get a new Tinkerbell one (the main type I collect) and a 15th Anniversary Animal Kingdom to commemorate 2013 and the first time any of us had been to Animal Kingdom. Minnie Ears: Party City ($5.99). Charlotte and I each had a pair of these for the trip, though I wore mine way more then she wore hers. Glow Necklaces: These are a MUST for all the parades at night, ($1.99 is way cheaper then anything else sold at the parks). We did Princesses and Mickey Mouse for the kids. Misc: Glow wand of Tinkerbell from Target toy section under $4. Princesses toy phone, Jake pirate phone and magna-doodle. Pins: As previously stated I picked out 3 pins to bring home to add to my collection of park pins and exclusive movie reward pins I have from the club. Mr. Potato Head: You can go to the store ONCE UPON A TOY to get a box of pieces for $20. We asked for one of the workers to help us pack up the box, and she fix tons of things in that tiny box. Hats, feet, accessories, Mickey Gloves, etc and I agree with other information floating around blogs/pinterest do not buy the potato head there he will fill up most of your box, bring one from home, or just keep the box of parts until you get home (which is what we did). 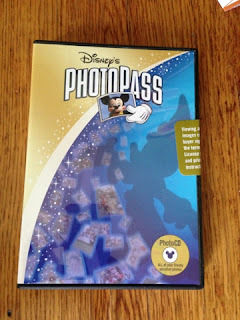 Disney Photopass: We did this back in 2009 and knew we would do it again with the kids so we PREORDERED the CD, by doing this you save $40. The basic package become $120 instead of $160. If you want to get the photopass+, it is $150 purchased at least 14 days before your trip. The photopass+ includes photos of select character meals and select rides throughout the parks. A list of the parks and photographer locations can be found here. We only did the regular photopass since our character lunch did not participate and the kids didn't go on many of the rides that were included on the photopass+ when we go back again and know they will be joining us on the bigger rides this will be a must for us. Our pass had 90 pictures on it when we were done with the parks, each pass online includes pre loaded pictures you can add to your CD at no additional cost from the parks you had visited using the pass. Online you are also able to do basic edits (color tones, black/white and sepia), zoom, adding borders and/or signatures and graphics. All said and done our CD wound up with 132 pictures. REMEMBER to take a picture of the code on your photopass incase you loose it. All your pictures are saved and can be looked up and put on a new card if you loose your first. Ours got lost (we think) after visiting Mickey since Charlotte ran back in to get one more hug and we were distracted. Thankfully I took a picture so they looked up my pics and placed them on a new card. Also you can have MULTIPLE cards (i.e. your party is big or your family separates at times for different things) this was you can still have all photos on one CD saving money from buying multiple CDs. 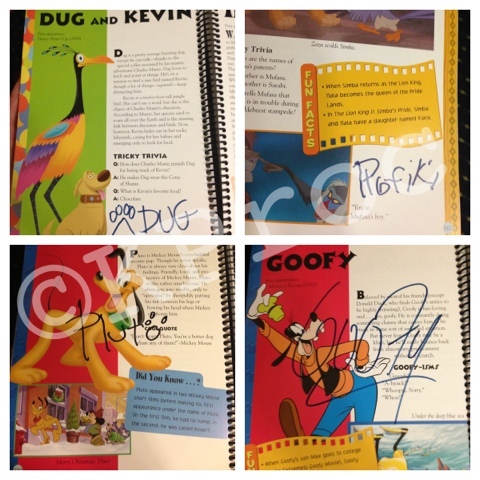 I bought the DisneyWorld autograph book online before we left to have for any and all characters we met to sign. Charlotte loved running up to everyone in costume to have them sign her book. This book was also the main reason for them fighting with each other, which is funny at 20months and 35 months. 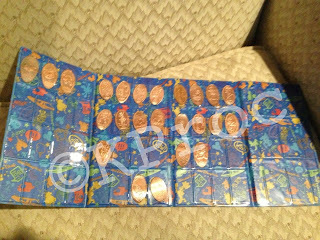 Thanks to Pinterest and this blog, we also had this for the characters to sign. As luck would have it we had this book in their bookcase before I even saw the idea. My years of buying books at book fairs and from book orders while teaching finally paid off. So I took this book to Staples and had them laminate the covers and got it spiral bound for easier access. We used this book in the weeks leading up to the trip to read about characters we knew nothing about (the kids at least). We got so many compliments on our book while standing in line waiting to meet the characters. 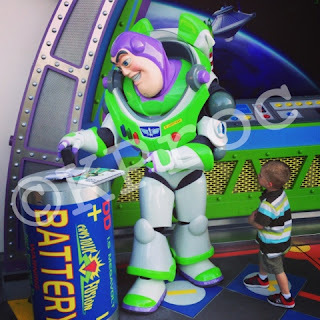 Also the characters interacted with our book: Buzz took the book and signed it himself instead of using the stamp he had for the autograph books, then went to Jessie's page and used it to beat his heart, and showed the entire line her picture while motioning that he loves her. Dug and Russell pointed at their counterparts (Mr. Fredrickson and Kevin) to name a few. It only is animated characters so either added blank pages to the back or getting the other book I mentioned is suggested. I have a favorite book that I got back in 2009, it is rereleased with updates each year and acts like a scrapbook with pockets and agenda pages in the back up to 14 days. I did not buy a new one for 2013 figuring we were only going to the parks 2 days, so I just brought my 2009 edition with me for review purposes and scheduling help. 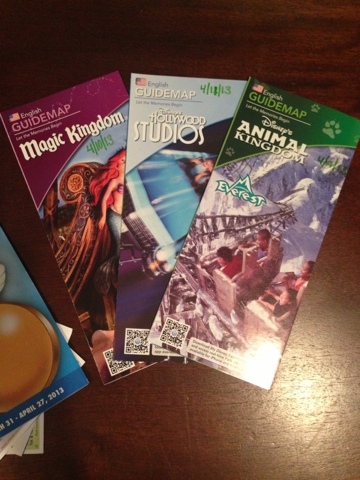 I did buy a Walt Disney World with Kids 2013 book too for more of the park and outer park experiences and help. I would suggest either along with a notebook to plot your own days' schedule and keep notes on what you did, liked and didn't like. 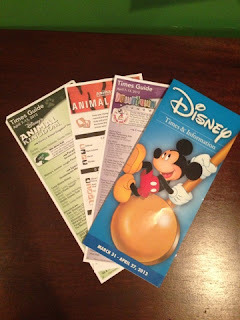 Each park has it's own map and then weekly schedule insert of everything that is going on in the parks. I took 2, one that was used and beat up all day and marked with what we did, the second was a "final copy" that I wrote the date we visited and all the rides/stores/food places we were at in the park. 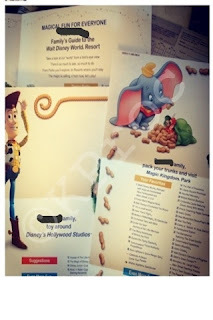 I will insert these in our photobook when it is complete to forever treasure the kids first Disney World Visit. Disney also offers FREE custom maps that come in an adorable folder with maps printed up listing whatever rides you choose and your last name on them for each park. Did I mention this is FREE? Click here and make your own, mine came within 2 weeks, and you can only order one set every few months. Another cool and free souvenir!! I wanted/needed something for the kids in the emergency case they are separated from us in one of the parks, really anywhere not with us. FL is a long way from NY and both kids can't reply where they live or our first names in my opinion, at least not Char. I started to look at tattoos that would have my information on it, then after asking a group of friends someone suggested a daily sale site that was offering TigTagz. BINGO! I ordered 36 of the Unisex style and put on them "if lost please call my mom and dad (with our 2 numbers on it). 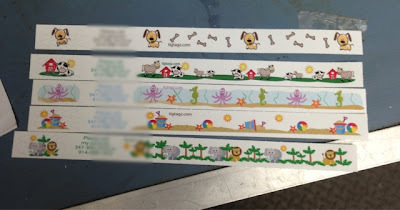 The bands lasted 2-3 days, longer if my kids didn't realize they were on at that point and request them off. The kids needed us to take them off for them. They didn't fade with sunblock, pools, baths, dirt and sleep. I was stopped a few times asking where I got them, if you don't have time to order or want something cheaper/free: ALL guest services have stickers to place in the kids shirts and you write your own information on them. I have one (top right in picture) from 1993, my first visit. I knew I wanted to get the kids some from their first visit, too. 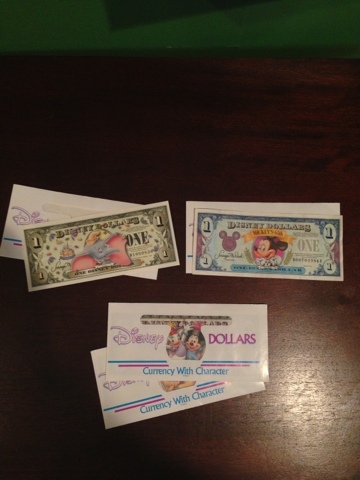 $1 for a $1 even exchange to turn your dollars into Disney Dollars. 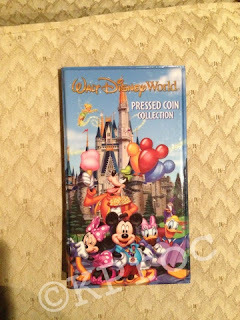 They were sold out of all 2013 ones so Jack picked out 2 dollar bills for him and Minnie Mouse was on the $5 bill and he wanted Charlotte to get that. They gave us currency envelopes to hold each bill. Money never expires and a cute memento. I love the photopass! 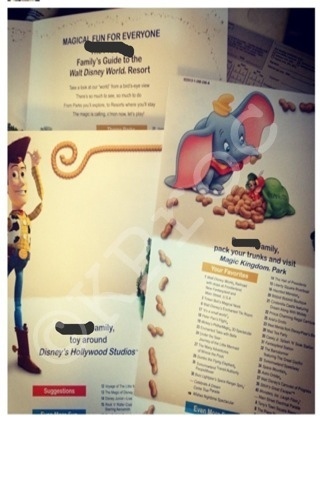 My ex and his family did that when we all went there and it was awesome having all the photos the Disney photogs take!